Contrary to popular assumption, cruise ships that visit Oporto don't sail up the River Douro. They moor several miles north of the river mouth in the commercial port of Leixões, which is pronounced something like "Leh-shoys" (try for a nasal intonation). Leixões has a Cruise Terminal, located on Dock 1 North, occupying an area of around 840 square meters. The Leixões Passenger Terminal is one of the finest examples of the architecture of the nineteen-sixties and it has recently been considered a part of the Architectural and Historical Heritage of the City of Matosinhos. Oporto City Center 8km. Take the metro across the bridge, called "Mercado Station"
Cruise ships may also dock at the brand new South terminal or just "Cruise terminal), for which the following applies: There are continuous free shuttle buses to/from the pier exit. At both terminals there are red, blue or yellow hop-on-hop-off buses for Porto. Do not preorder tickets yet, as not all busses stop at the cruise terminals, just buy the ticket from the driver. Hop on busses are about the same price (10 Euro) as the cruise ship shuttle to town, therefore a much better deal. Alternatively, take a 250m walk to the Matosinhos Sul Metro tram stop. Buy a round trip ticket, hold it up to the circular sensor on the ticket reader, and board the next train for the 30-minute trip into Oporto. Tickets are about 2 Euro. About every 15 minutes, get off at Bolhao for the city center. The metro is wheelchair accessible. Another transportation option, if your cruise line doesn't provide a shuttle, is public bus 500. Catch the bus at the shelter just outside the port entrance. Finally, a taxi between the port and central Porto shouldn't cost much. (around 20 euro) If you can't find a taxi on the pier, walk across the bridge to Matosinhos. From the port the Dom Luis I bridge is the most direct link to Ribeira, the oldest district of Porto; you can get a bus or walk across. Hop on/off tour of Porto also stops right where you dock. 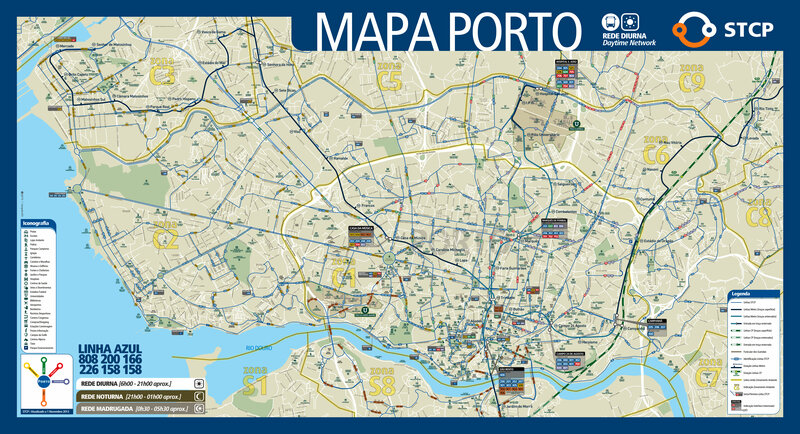 Printable map of Porto to take along. Cruise calendar for this port and which terminal is used. Ribeira, meaning a river bank, is a part of the city Porto close to the river. It was classified as a UNESCO World Heritage site in 1996. It consists of a maze of narrow steep cobbled-stoned streets and houses with colorful facades, many decorated with azulejos(tiles). Ribeira is a good place to start a sightseeing tour of Porto. While walking along the embankment you can best feel the character of the city. The wide river Douro divides it into two parts. Around the 12th century cathedral Sé in Terreiro del Sé, is a good place to start the sightseeing. Inside is a beautiful 14th century cloister. At the front of the cathedral is a high stone balcony offering fabulous views of the city and the river. In the Roman times there were two settlements on the opposite banks: Portus and Cale. They gave rise to the duchy of Portucale, which was a part of dowry brought to Henry of Burgundy by Teresa of Castilia. Their son Alphonso, having reconquered most of the country from the Moors, became the first ruler of a new kingdom, which he named Portugal after the land of his parents. São Bento Railway Station, Inaugurated in 1916, the historical station is known for its tile (azulejo) panels that depict scenes of the History of Portugal. When you are tired of walking you can sit in one of numerous cafes or restaurants in Cais de Ribeira. From here you can clearly see Villa Nova de Gaia on the other side of the river. This is where port wine is made - hence many signs of its producers: Sandeman, Ferreira, Taylor or Graham. Then you can walk over Ponte Dom Luis I to the other bank or just stand on the bridge to have a wonderful view of the city. Be informed on how to get around by the available means of transportation. Here is where you will find all necessary information on metro, bus, tram, taxi, or simply rent-a-car services. Porto is a very hilly town. If you take a hop on tour, get off a São Bento Railway Station and walk down towards the river, a pleasant stroll, hop on again. Hop on/off tour of Porto. Rua das Flores is lined with silversmiths and the best leather ware shops are on Rua 31 de Janeiro. Look for crafts made of cork. When talking about Porto we must mention some traditional dishes, such as the Porto Style Tripe which gave the city's inhabitants their nickname - tripeiros - i.e. those who eat tripe. This dish, famous not so much for its preparation (veal's tripe with sausages and butter beans) as for the altruistic attitude of the Porto people who, in a moment of need, donated all the available meat to the ships leaving to conquer new cities in Northern Africa and kept only the animals' tripe for their subsistence, is today's major symbol of the city's gastronomy. Port wine (also known as Vinho do Porto, Oporto, Porto, and often simply Port) is a Portuguese, fortified wine from the Douro Valley in the northern provinces of Portugal. It's typically a sweet wine, but comes as dry or semi-dry too. It is often served as a dessert wine. For internet cafés: check with the tourist office at Rua Clube dos Fenianos, 25 in Porto. Free WiFi at the cruise terminals, often very busy with crew members. Shopping hours Generally Mon-Fri 0900-1900, Sat 0900-1300. Shopping centers are usually open Mon-Sun 1000-0000.